You need not be an entomologist to identify different types of bee species. Although there are more than 20,000 different types of bees recorded and classified until date, you can differentiate a few common and important ones just by looking at their external appearance or their habitat. Bees are grouped under order Hymenoptera. They belong to the sub order Apocrita. You can look through different research books and magazines that specifically deal with identifying and differentiating different types of bees. You can also look through various websites on the internet to get a better visual and/or pictorial representation. Bumblebees have a distinctively roundish and plump middle body. They are extremely hairy too. Carpenter bees are found in moist areas. You can distinguish them very easily by just looking at their location. They will build beautifully carved houses inside damp woods by making hollow tunnel like structures. They are generally black in color and do not exhibit any marked colorations or demarcations. Honeybees on the other hand are smaller when compared to bumblebees. They also have a distinct yellow black demarcation in the center. They have a sac-like structure on their hind legs. They use this sac for storing pollen. Orchid bees are extremely colorful and look attractive. They exhibit gorgeous bright metallic colorations. If you find a bee happily digging a hole on the ground or soil, you have found a plasterer bee. Digger bees use woods or grounds to make their homes. 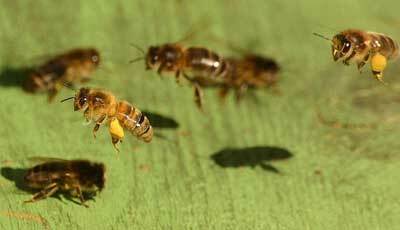 These bees store pollen on their hind legs exactly in the middle. 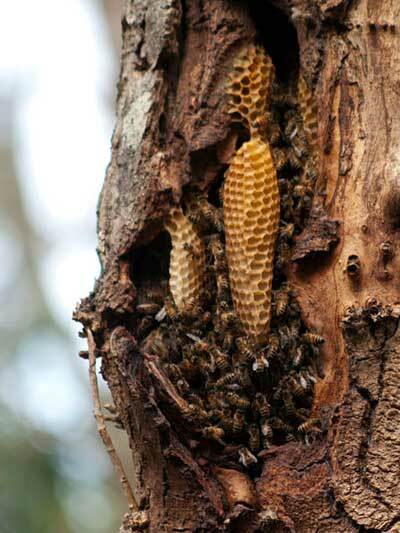 Bees are naturally attracted to places that have numerous trees. If provoked, they can turn out to be quite aggressive. They are extremely active at day time and move in groups when threatened. Removing a beehive is a risky job unless you know the dos and don’ts involved in the procedure. More..